Dobrich is in the hills of the Danubian Plain and Dobrudzha. It is called “The Granary of Bulgaria” because of its fertile earth and arid weather. The capital of Dobrich is the market town of the same name. Ecotourism flourishes here. Kaliakra (which means “beautiful headland”) is a long, narrow promontory that juts out over the Black Sea. It has a nature reserve that protects dozens of rare plant species, the remains of a Byzantine fortress, and the Gate of the 40 Maidens, an obelisk that pays tribute to 40 girls who braided their hair together and jumped into the sea rather than be captured by the Ottomans—or so a 13th century legend goes, anyway. Today, girls (and other visitors to Kaliakra) would probably rather go dolphin-watching instead. Other natural sites of great interest along this stretch of the Black Sea coast are Baltata, a large, dense forest, and the protected wetlands of Lakes Shabla and Durankulak. 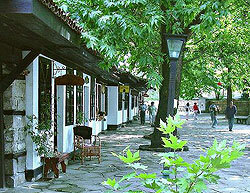 Dobrich is the site of some ancient Thracian and Greek cities, as well as medieval citadels. Following Bulgaria’s defeat during the Second Balkan War, southern Dobrich was annexed to Romania. The summer villas of the Romanian royal family, in an idyllic park in Balchik, still stand today, a graceful witness to that period in Bulgarian history. Tradition is alive, too, in the Gagauz ethnic group, with their distinctive customs, native costumes and Turkic lingua franca. There are many seaside resorts in Albena and Rusalka, and in the towns of Balchik, Kavarna and the little village of Kranevo. Camping grounds near Lake Shabla are also popular with tourists, and game reserves located all around the region welcome hunting enthusiasts. Dobrich’s regional capital is an important trade centre, and one of the biggest and most populated cities in Bulgaria. The old city is full of delightfully reconstructed Renaissance buildings. Dobrich has almost 100,000 inhabitants; it is one of Bulgaria’s major cultural centres. Dobrich has its own medical institute, symphony orchestra, theatre, and numerous high and technical schools. Dobrich was once named Tolbuhin, after the Soviet general who liberated the region from the Nazis in 1949. After the fall of Bulgarian Communism in 1990, the region and city’s names reverted to Dobrich. The city’s top industries include textiles and shoe manufacturing. 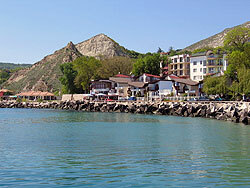 The small port of Kavarna with its calming Black Sea scenery has become one of Bulgaria’s main tourist centres. It is a contemporary little town, with modern European architecture and modern roads leading to the main interesting places to visit, including Roman ruins atop the high Chirakman Hill, a fishing base, a yacht port, and a beach that attracts many tourists. Many eateries can be found in the town centre and near the beach. The natural beauty of the area and the many business opportunities has attracted many Russian investors. Celebrities have bought apartments in the upscale White Coast vacation village and SPA complex, just minutes away from town. Other desirable addresses are the properties near the Trakya Rocks golf course.